For the past 9 months I've been exhaustively researching and writing a book that I've tentatively titled "Investing for the End of Cheap Oil". In my book I summarize the current state of peak oil and "peak everything" and I analyze how these megatrends will affect various countries, industries and companies. I look at the arguments against peak oil, the corroborating reports confirming peak oil, the economics that are at play behind the scenes, the limits that exist to alternative energy sources, and the various scenarios that may play out in the future. 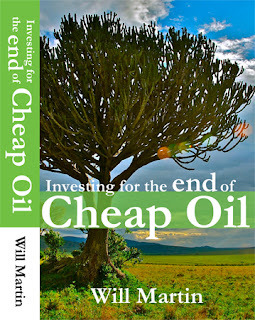 Finally, I finish the book with a few examples of diversified portfolios that can be easily constructed by individual investors to profit from peak oil and peak everything. If you're interested in being notified when the book is published, you can sign up for updates here. I haven't yet started looking for a publisher, but I want to start getting some of my ideas out for discussion, so I'm going to be doing more blog posts and videos in the near future. I'm also working to do some more public speaking to get my ideas out to a broader audience. I just confirmed that I'll be giving a presentation on investing for peak oil at the 2012 Association For the Study of Peak Oil ASPO-USA conference in Austin, TX on December 1st. The schedule of events can be viewed here. I attended the ASPO-USA conference last year in Washington DC and I found it to be an extremely beneficial experience. I got to meet a lot of great people and I found the lectures to be extremely helpful. I'd highly recommend the conference to anyone who is interested in the topic of peak oil. Registration is open now here.